Dorper Sheep appear white but they are actually genetically a black sheep with a huge white spot covering its entire body except for the very striking black head (black headed Dorper). 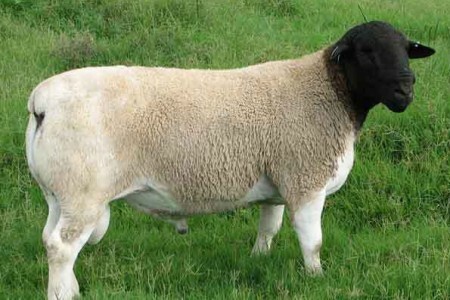 The Dorper is a quality meat sheep with all its easy care attributes highly developed like no other breed in the world. The White Dorper has the same breed standards as the Dorper (Black headed) except where color and markings are described. The White Dorper still has all the same labor saving qualities as the Dorper together with a great carcass. But as its name implies the White Dorper is genetically a white sheep therefore all its progeny should be white except when mated to a black sheep.